Fox News’ Juan Williams claimed Tuesday that men make up 70 percent of Google’s workforce. Sixty-nine percent of Google’s workforce was male in 2018 and 31 percent was female. Williams, a co-host of Fox News’ “The Five,” made the claim after fellow co-host Greg Gutfeld brought up a recent pay equity analysis from Google that showed that the technology giant was underpaying some male employees. Adjustments in pay, totaling $9.7 million, were given to nearly 11,000 Google employees, many of whom were men. “Men were flagged for adjustments because they received less discretionary funds than women,” the company said in a blog post. Google also made pay adjustments for new hires. “To me the larger part is this – 70 percent of their workforce is male,” Williams responded. Williams’ claim is supported by Google’s 2018 diversity report, which shows that 69.1 percent of all employees are male and 30.9 percent are female. Female representation at Google has only increased 0.3 percentage points since 2014. There were nearly three times as many men in leadership positions as women in 2018, 74.5 percent versus 25.5 percent. According to Google, white men made up 52.4 percent of all leadership positions, down from 53.8 percent the previous year. Men made up most of the new hires in 2017, 68.8 percent. 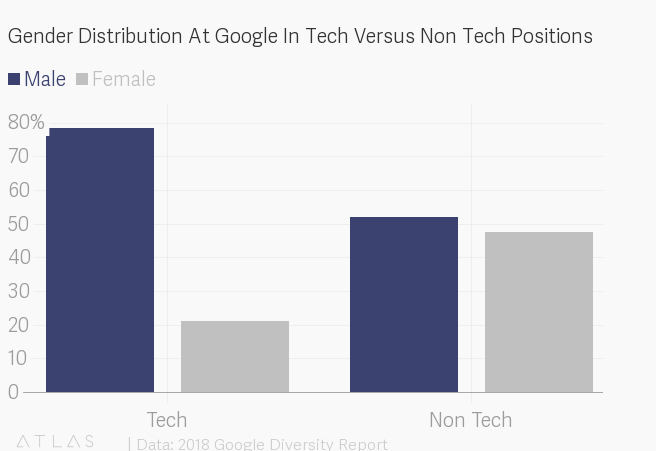 While men make up the majority of the workforce at Google, women see more representation in non-tech jobs. Women made up only 21.4 percent of all tech positions at the company, but 47.8 percent of non-tech positions. Google acknowledges these disparities and says it is working to improve gender and racial diversity at the company. In early 2017, a Labor Department official accused Google of “systemic” disparities in compensation against women, a charge that Google has strongly denied.